Hello there! So are you planning to revamp or renovate your house? If yes I have a good news for you. Well, for my Muslim friends and readers Hari Raya is coming soon, I am sure some of you plan to refurbish your home. I just visited MajuHome Concept Flagship store at Citta Mall and spotted a few furniture that are perfect for my home. Here is the sneak peek and also don’t forget to MajuHome Snap & Win photo contest because you stand a chance to win prizes up to RM10,000. Alright let’s take a quick tour at this newly opened MajuHome Concept Flagship store. It’s a one stop center for our home furnishing needs from bedroom to living, dining, store, kitchen, bathroom and etc. MajuHome Concept Flagship store occupy floors in Citta Mall, the first floor is for kitchen and bath and the second floor is for all the home and office furniture including home décor items. Can't wait for their grad opening beginning of June and will definitely share more photos during the launch event. 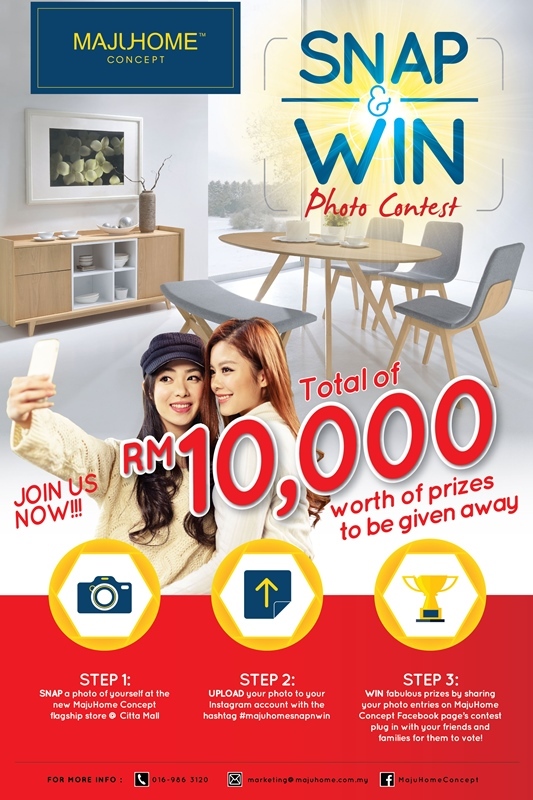 If you are there please remember to take photos of yourself or selfies in the most creative manner you can and participate in MajuHome Snap & Win Photo Contest, you stand a chance to win away fabulous prizes that is worth a total of RM10,000. Step 3: Win fabulous prizes by sharing your photo entries on MajuHome Concept Facebook Page’s contest plug in and get your friends and families to vote for you. I have submitted a few entries under name @sunshinekelly2988 feel free to vote for me. I hope you join the contest too. All the best! Nice!! loving some of the items there.. must go and visit one day! The furniture there looks unique. Hopefully I able to win one of the prize away. the furniture look quite special. love your outfit!! Awesome concept! I would love to join the contest to win this fabulous prizes! Looking great dear. Good luck for those participants. such beautiful furniture. I think soon i need to change my sofa. Will check out this place. Thanks so much for sharing sweetie. xoxo. I will go and check it out for the furniture. and also join the contest. Wow, they are really giving huge prize. I liked the stuff here. I think quite a good deals and lovely furniture. Recently bought furniture for my home and have checked all these options.